Neil Hauer is a security analyst based in Tbilisi, Georgia. He contributed this piece for the Syndication Bureau, an opinion and analysis article syndication service that focuses exclusively on the Middle East. Russia’s military intervention in Syria has resulted in significant benefit for the Damascus regime. It has seen Syrian government forces regain control of most of the country, conquering Aleppo, the ISIS-held central desert and most rebel strongholds. But while battlefield conquests are straightforward, a wider resolution of the conflict is not. Major issues – involving the Kurdish-held north and the ultimate fate of Idlib among other things – remain, to say nothing of the flight of one-quarter of the country’s population and the devastated state of the economy. To address this, Moscow wants to replicate an example of conflict resolution it knows very well: that from Chechnya, the former breakaway republic that was brutally reconquered by the Russian army in the early 2000s. Russian officials have consistently cast the Syrian conflict in similar terms: describing rebel fighters uniformly as “terrorists,” denouncing the illegitimacy of the opposition and depicting a necessarily harsh struggle against Al Qaeda hordes. Russia’s embassy in Washington went so far as to cite Grozny, Chechnya’s shattered capital that has since been luxuriously rebuilt, as a model for Aleppo. The Chechnya model, however, has been a disastrous one that has entrenched a brutal regime, created tens of thousands of refugees and set the stage for a very likely future conflict. It would likely do the same in Syria. Vladimir Putin began his first term as Russia’s president with a heavy-handed invasion of Chechnya, which had been outside Moscow’s control since the Soviet Union’s breakup in 1991. Wanting to avoid urban combat, Russian airpower flattened Grozny, generating tens of thousands of refugees from what the UN, in 2002, described as “the most destroyed city on Earth.” Russian forces then pursued retreating rebels into the mountains, rooting out their strongholds as the conflict shifted to asymmetric warfare. Over a period of years, Moscow increasingly handed off control to its local proxies, “Chechenizing” the conflict as federal forces pulled out. A series of large-scale amnesties for rebel fighters following major defeats sapped the insurgency’s strength, while pro-government Chechen forces, under the leadership of Ramzan Kadyrov, were given a free hand to brutally suppress any remaining dissent. Federal subsidies flowed in to rebuild the capital as a shining, modern city, and the organized insurgency was eventually destroyed. This pattern should sound familiar to Syria watchers. In 2015, Russia entered the Syrian conflict by unleashing a massive and largely indiscriminate bombing campaign. Over the next two years, Moscow’s support enabled Syrian regime forces and their allies to recapture most of the country, with the exception of the north. Russian bombing then dropped off substantially; this year, airstrikes were halted entirely for a number of limited ceasefire periods. Russian military police on the ground brokered a number of reconciliation and evacuation deals, through which rebel fighters either departed to Idlib or handed over heavy weapons to remain as subordinate to the regime. Once these deals were complete, Russian forces soon departed, leaving the reclaimed areas to the depredations of pro-government militiamen. Moscow is also sponsoring several prestigious rebuilding projects of iconic mosques in Homs and Aleppo, carried out, ironically, by the Chechen government. Thus, it is useful to see what Russia has accomplished in Chechnya. Today, Chechnya is a police state, likely the most brutal anywhere in Europe, that rules through extreme repression. Torture, collective punishment and arbitrary arrests are commonplace. Unemployment is estimated at around half the population, while the territory is entirely dependent on federal subsidies, which comprise 85 percent of the budget. Chechnya continues to produce more refugees than anywhere else in Europe, with over 100 Chechens attempting to flee to the European Union every day. 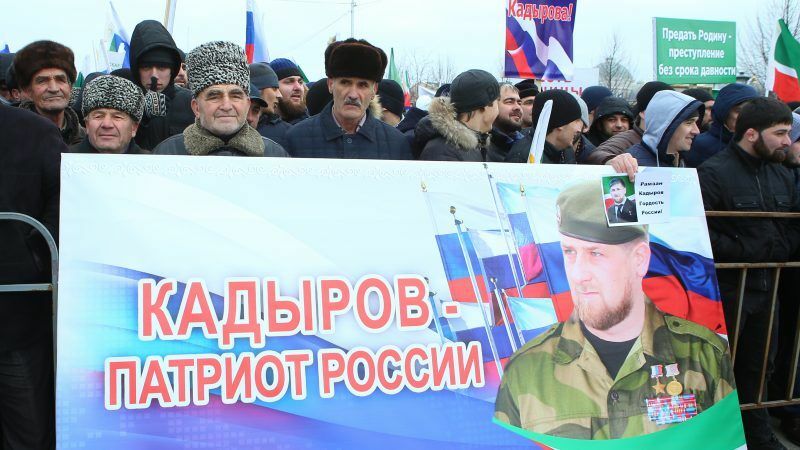 None of the emotional scars have been reckoned with, as the recent mass demonstrations in support of the Chechen man convicted of killing a particularly cruel Russian army commander for abuses during the war showed. Kadyrov’s control is ensured only by his ability to buy the loyalty of tens of thousands of militiamen. With many openly angry at his regime’s abuses, there is little doubt there will one day be a third war in Chechnya. There is also little reason to think the Chechnya strategy is viable in Syria, given the vast disparity in scale between the two. Chechnya is a small place, both geographically and population-wise: at the start of the Second Chechen War, there were more servicemen in the Russian Armed Forces than there were inhabitants of Chechnya. Syria, by contrast, has a population verging on 20 million and is more than 10 times physically larger than Chechnya. Perhaps most importantly, it does not lie in proximity of the Russian Federation. This is to say nothing of the cost. As Russia was annihilating Grozny in 2000, a Russian official estimated the republic’s reconstruction costs at $1 billion. The UN’s present estimate for Syria puts the price tag at $388 billion. One look at Chechnya today should tell observers that Russia’s desired approach to “resolving” conflicts is an extremely brutal one, not to mention ineffective. The international community’s continued involvement in shaping the future of Syria, especially Idlib and the Kurdish-held north, will be crucial for mitigating this unattractive fate. The world failed Chechnya. It has largely already failed Syria as well, but the international community should do what it can to avoid yet further degradation. Come on, Russia has invited the moderate opposition to join in the effort to restart a political process in Syria. But there are plenty of terrorists too. Would anyone deny it? And, with those, Russia, but Syria, Iran and Turkey as well, don’t want anything to do. There is also a difference between Chechnya and Syria. The former is part of Russia, the latter isn’t. While in Chechnya, Russia can govern, in Syria Russia has to work with and through the legitimate government. This is the usual slander piece against Russia.